When I'm at college with my friends you can grantee that someone will say to me "I wish I was skinny like you." or "You're really lucky being skinny." I get a lot of comments on my small stomach, skinny legs and generally about my weight. These comments are all positive and annoy me to the point that I now wear baggy clothes to hide my true weight because I'm sick of people aiming to be my weight. I'm underweight and am classes as having an eating disorder. To be blunt, I am slowly killing myself. In other posts I have talked about my recovery and I assure you as hard as things are at this moment in time I am still doing ok, but being totally honest with you, I am slowly killing myself by not eating. That's quite a hard thing for me to get my head around. But hears the thing, my friends want to be my weight. They see my body and see something good and pretty, something to aim for. This breaks my heart. I want to tell them what I've done to myself to get to the point that they see something beautiful. I want to tell them about the times where I would have preferred to die than to face another day with an eating disorder. I want to tell them the feeling of panic when I had to sit down and eat by other people. I want to tell them about the arguments I've had with the people closet to me about my weight. I want to tell them how many people I've hurt by doing this to myself. I want to tell them that this could kill me. I want to tell them how horrible it feels at night to lie down and to feel nothing but bone touching bone when I sleep on my side. I want to tell them how disgusted I feel when I wrap my arms around my torso and can feel so clearly my ribs. I want to tell them about the times when I can touch my side, feel my bones and my ribs but when I look in the mirror I see someone who is fat. ot everyone who is skinny will have done this to themselves, some of us are naturally that way. I know I've always been underweight and no matter how hard I try through my recovery I know I will never make it to the healthy weight bracket simply because my body was designed that way. But here's the thing. You do not have to be skinny to be beautiful. 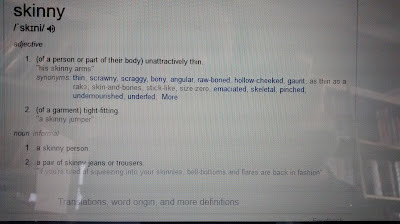 (of a person or part of their body) unattractively thin. 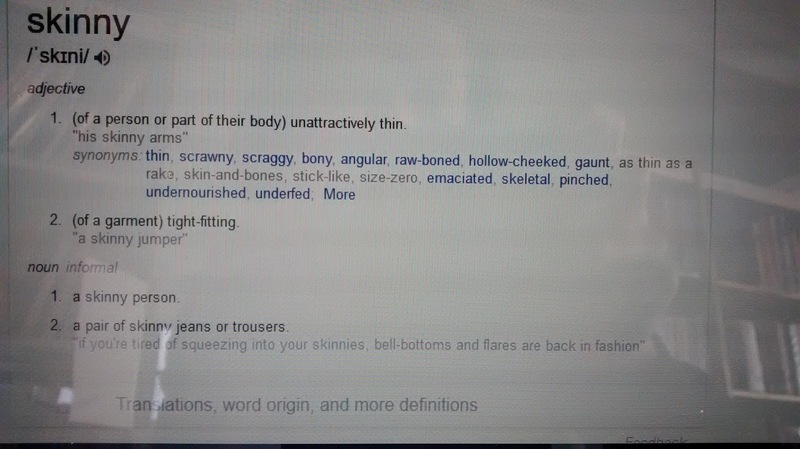 Notice the phrase unattractively thin, or how about the words Bony or undernourished? I'm not saying that if you are a smaller sized person that you are unattractive. Nor am I saying that every time people compliment you by saying that your are skinny that they are secretly insulting you. What I'm trying to say s that people have got it into their heads that you have to be this unhealthy and unachievable weight (for a large amount of people). We have got so focused on your image and we have got it in out head that we have to be skinny to be considered beautiful. This is not true. You are beautiful when you are being you. Life is so much more that how many likes your instagram or Facebook posts get. There is so much more to life then spending it trying to be this body shape simply because other people in society have told you that that is what you must do to be considered beautiful. You are beautiful no matter what your body shape is. So please don't think that you have to be 'skinny' or a size 6 to be beautiful. I don't care if my friends are size 18, 12, 10 or 6. What I care about is the person that is inside that body. I don't care about their body shape, as long as you are healthy you can look however you want to look and you can be what ever size you want to be. You can wear as much make up as you like or as little as you like, you can have as many piercings or tattoos as you like, all I care about is that persons personality at the end of the day. If you are a kind, honest friend I will not care how you look, and you know what being a good person makes you even more beautiful. I'm not too sure where I'm going with this post. I wasn't sure where it would end up, I just had some things that I wanted to get off my chest. But in all seriousness, you really don't have to be skinny or thin to be beautiful. If I could I would tell everyone ever day that they are beautiful. If I could I would spend my day encouraging other to love themselves as I know what it's like not too. So I'm going to end this post here. I don't know who reads my posts. I don't know who you are or what you're going through, but I do know that you're beautiful as you are and please don't ever feel like you're not.